When the battle is at its most brutal, trust in your blade. 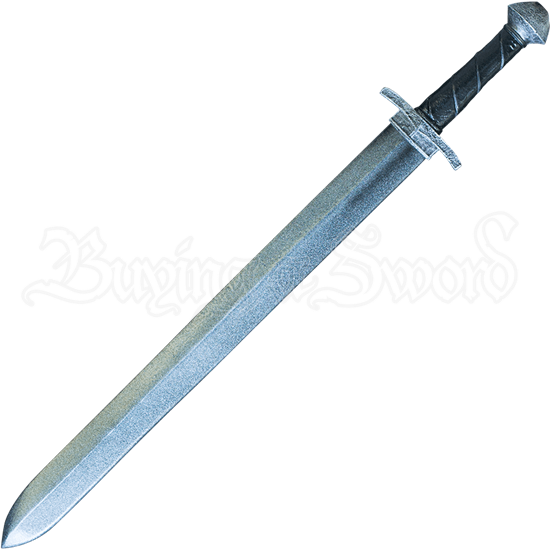 The Ready for Battle Basic Errant LARP Sword is modeled after medieval arming swords and blends historical and fantasy aesthetics for an undeniably knightly appearance. A ridge runs down the length of the silver tone blade before meeting the cast polyurethane foam hilt. Hand painted for an artfully weathered silvery look, the short guard curves slightly towards the blade. Beneath it follows a grip painted and sculpted to resemble real dark leather. After this comes a 15th century English style pommel painted to perfectly match the guard. This medieval LARP sword consists of a fiberglass core with a Kevlar tip surrounded by high quality, closed cell foam. A strong latex coating lends additional sturdiness to this live action roleplay weapon. For all your knightly errands, take the Ready for Battle Basic Errant LARP Sword in hand, whether you are a LARP beginner or a seasoned warrior.